This searchable catalogue showcases a wide range of nature-friendly Natura 2000 products and services being produced in or provided by many different Natura 2000 areas around Europe. 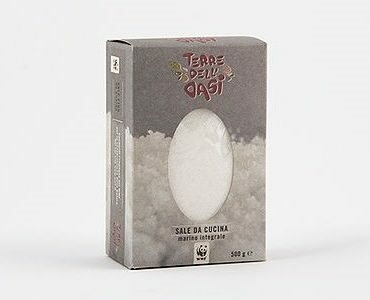 The products are the result of inspiring collaborations between people working in and around Natura 2000 areas, giving these people direct socio-economic benefits. 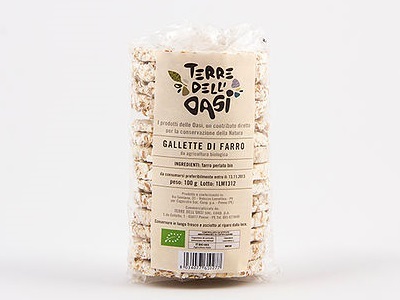 Farmers in the Terre Dell’Oasi cooperative use the “Senatore Cappelli” cultivar of durum wheat. This variety of durum wheat flour contains a higher percentage of lipids, amino acids, vitamins and minerals compared to the modern cultivars of wheat. In addition it has a higher tolerability and is easily digestible. Senatore Cappelli wheat is ideal for organic farming: firstly it does not require the use of herbicides as it can grow up to 150 – 180 cm suffocating weeds and other invasive plant species, and secondly it has not undergone any form of genetic manipulation. These characteristics in addition to its nutritional values have made it a very prestigious and sought variety of wheat. 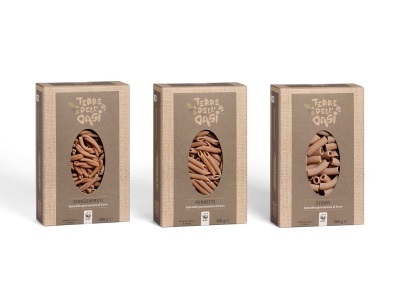 Terre dell’Oasi durum wheat products include: Spaghetti, Tagliatelle, Fusilli, and Pennette. 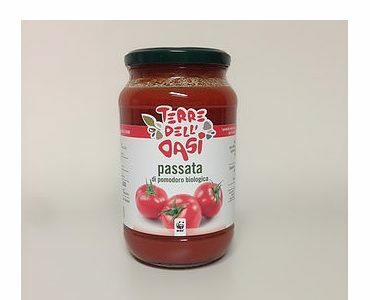 A package of 500 grams costs €2.70. One of the finest products made by Terre dell’Oasi, honey, is produced in the Bosco di Vanzago nature reserve. In this reserve bees are able to freely roam, pollinate the flowers and produce a top quality honey. It is rich in energy, contains high quantities of simple sugars (glucose and fructose), is easily digestible hence immediately absorbed by the human organism. Ideal for breakfast, it is the perfect food to start the day! It is also very rich in mineral salts; in fact honey contains the same minerals as maternal milk, particularly iron and calcium phosphates. 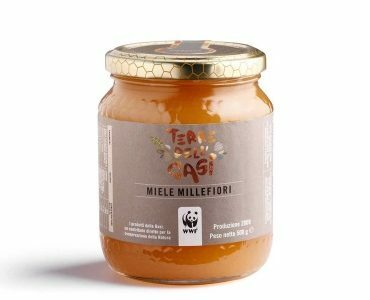 A glass jar of 400 grams Acacia honey costs €7.15 and a jar of 400 grams Linden honey costs €6.05. Terre dell’Oasi olive oils is produced from olives grown in the Lago di Penne nature reserve in Italy. Produced by organic farming method, the olives belong to a number of local varieties and are picked as soon as ready. Once harvested they are taken to the mill within 24 hours. Attention is paid to the temperature at which the olives are kept to avoid any alterations of their chemical and physical properties. Olive oil is known for its unique characteristics, particularly a high concentration of monosaturated fats, antioxidants and vitamins making it the core of the Mediterranean diet. This oil is ideal for the preparation of many dishes and can be consumed both raw and cooked. 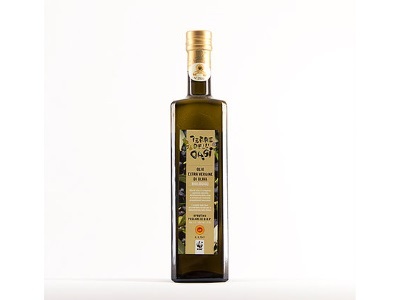 A green glass Marasca oil bottle of 75 cl costs €17.60 and a green glass Marasca oil bottle of 25 cl costs € 6.80. 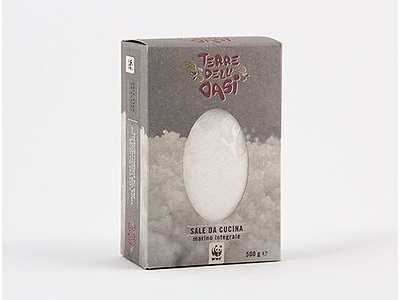 Terre dell’Oasi salt is produced in the Saline di Trapani e Paceco nature reserve in Sicily. The site is an important breeding and resting area for migratory birds like the greater flamingo and avocets. The salt is produced traditionally through the evaporation of seawater in dedicated salt evaporation ponds along the coast. Production is carried out in summer, particularly in July and August, and the salt is collected about two to three times a year depending on the climatic conditions. Collection is only done manually. Unfortunately, salt production by large companies is making it difficult for local salt farmers to remain in the market forcing many to shut their activity in favour of the industrialized products. 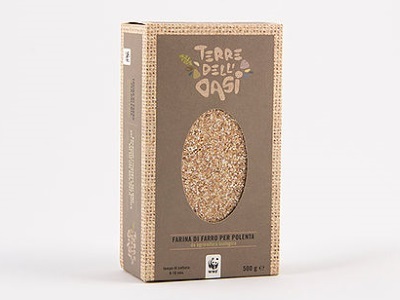 Terre dell’Oasi is therefore not only about protecting nature but also about giving the local farmers a chance to sell their products, and supporting local traditions. A package of 500 grams costs €2,00. Spelt is one of the oldest cultivated crops in human history. It is a variety of cereal closely related to wheat grain. The recent comeback of this variety of wheat is motivated by rising concern for healthier eating habits and an increasing demand for healthy food. Spelt is a highly nutritious grain, containing major concentration of proteins, unsaturated fats, vitamins and minerals, particularly magnesium essential for muscles. 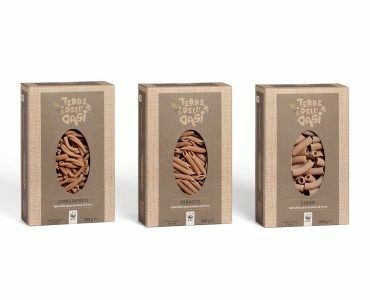 Its nutritional characteristics make spelt the ideal food for modern diets, as even when cooked, it continues to be rich in fibre and starch. 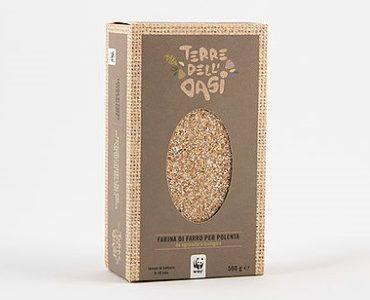 Terre dell’Oasi spelt products are made with spelt grown in WWF nature reserves within the Natura 2000 network. 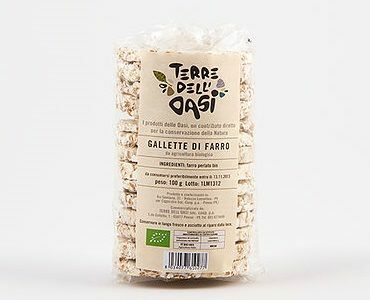 It is grown according to the principles of organic farming in the Lago di Penne and Laguna di Orbetello nature reserves. A package of 250 grams spelt biscuits costs € 3.20. For all products and for ordering, go to the webshop. A package of 500 grams spelt cakes for €1.75. For all products and for ordering, go to the webshop. A package of 500 grams costs €3.70. For all products and for ordering, go to the webshop. 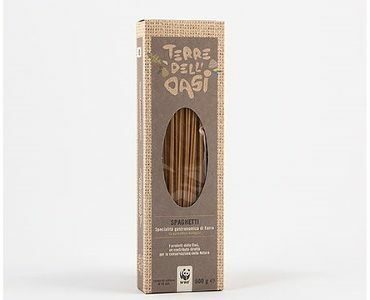 Terre dell’Oasi spelt products includes Pennette, Sedani, Strozzapreti, Gnocchetti, Tagliatelle, and Spaghetti. A package of 500 grams costs €3.50. 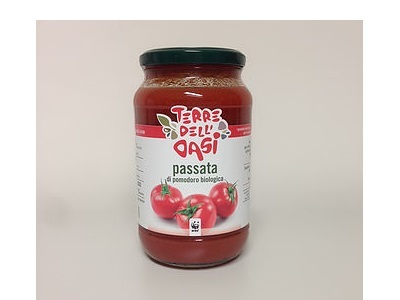 This deep-red coloured tomato paste comes from the warm, sunny southern Apulia region of Italy. It has a rich, intense smell and a sweet taste. Ideal for making a variety of dishes, cooking times should be limited to preserve the freshness and smell. 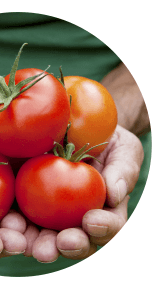 The producer has since 1981 converted to biodynamic farming, certified by DEMETER, the brand for products from biodynamic agriculture. A glass jar of 520 ml costs €3,00. As a forester (Stane), a naturalist with a Ph.D. in biomedical sciences (Petra), guides and photographers, the team behind these products spend much of their time in nature in the forests of Kočevsko and other beautiful wild parts of Slovenia. Eleonorina žajfa is their story – a product resulting from their professions as well inspiration for nature and the outdoors. Kočevsko is known for its extensive forests, wild places and as a landscape, home of large predators – wolves, bears and lynx. 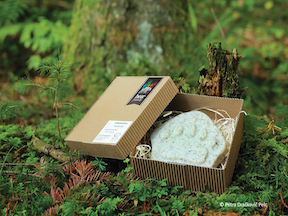 The production of this soap came into existence because they like the touch of nature and the wild outdoors. Originally produced as Christmas gifts for friends and family of the producers, the soap became very popular. 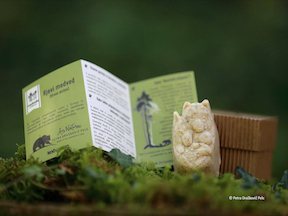 Adding to conservation by creating awareness for large carnivores, and forest and overall nature protection, the creation of cold-process herbal natural soap will continue. 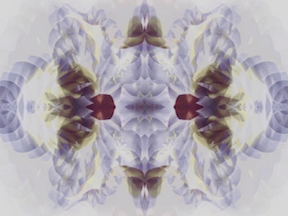 The Dutch visual artist Jola Hesselberth creates animated movies with the aim to connect people and nature through art. She does this by abstracting nature and implementing it in moving and repetitive material. Jola finds her inspiration close to her home, in the Natura 2000 area the Loonse en Drunense Duinen & Leemkuilen.